1. Are your truck and camper insured together or separately? Over 40-percent insure their truck and camper separately by the same insurance company. This is how we insure our truck and camper. It’s also the way we recommend truck campers be insured. Insurance companies look for opportunities to not pay claims. If you have two insurance companies involved with a claim, each may attempt to pass the buck to the other. Having one company insuring both the truck and camper prevents this potential challenge. 30-percent of readers answered that their truck campers are insured under their truck insurance policy. As one person wrote in their response, “AAA says it’s on the truck, so it’s covered”. That sounds great, but we would get it in writing. Even if you get it in writing, the important caveat with this approach is what might not be covered. For example, our camper insurance had coverage for our accommodations, camper contents, and the actual cash value of the camper. All of that was an incredible help after the accident. Nearly 19-percent insure their truck and camper separately by two different companies. This is likely due to the fact that not all automotive insurance companies recognize or insure truck campers. If you have dealt with the same insurance company for years and have a positive relationship, it’s tough to give that up just to have your truck and camper under the same insurance company. You might also lose a long-term customer discount or a bundled discount. The remaining roughly 10-percent either do not insure their truck camper, or insure it under their homeowner’s policy. If you insure your camper under your homeowner’s policy, it’s a good idea to get the terms of the camper’s coverage in writing. Remember, insurance companies do not want to pay claims they don’t have to. Get it in writing. If we had an older camper with little to no market value, it might make sense to not have it insured for collision. That said, we would still be concerned about liability. Maybe your insurance company could offer a very low rate just to cover liability. Things happen. 2. What insurance company is your truck insured through? 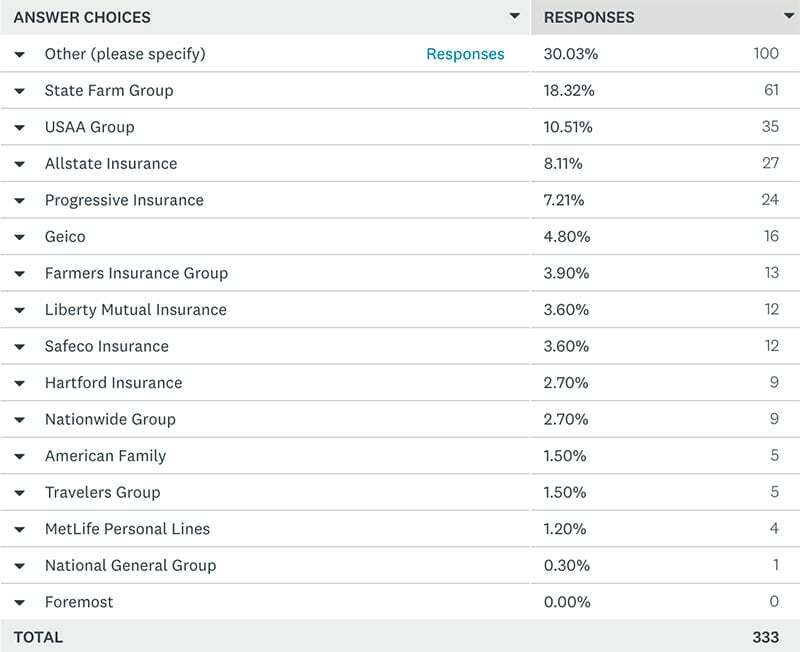 From our poll, the big insurance providers among our readership are State Farm Group, USAA Group, Allstate Insurance, and Progressive. Geico, Farmers, Liberty Mutual, Safeco, Hartford and Nationwide also put up some respectable numbers. Six other insurance companies came up multiple times in the comments; AAA Auto Insurance, Erie Insurance, Wawanesa Mutual, Auto Owners Insurance Agency, Amica, and ICBC (Insurance Corporation of British Columbia). Other named insurance companies only had one or two mentions. 3. What insurance company is your camper insured through? 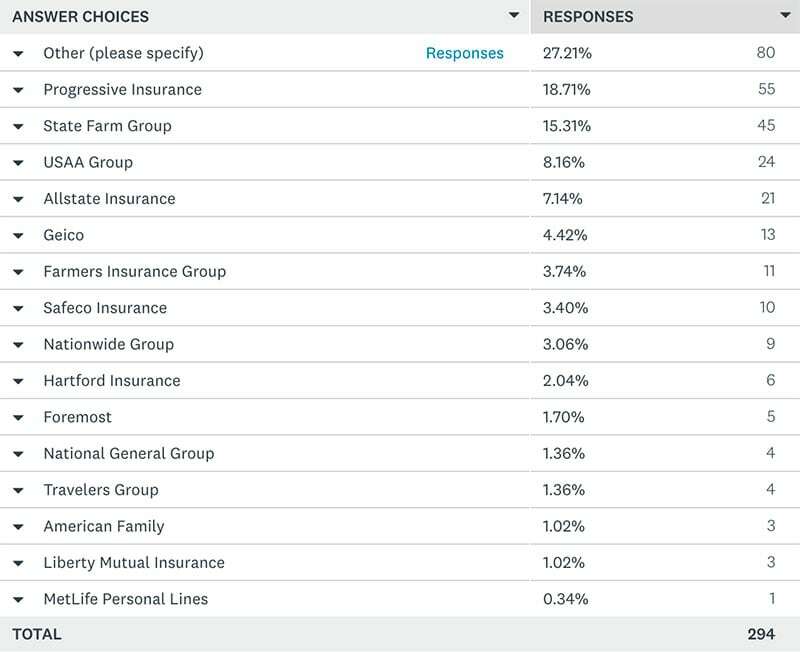 Interestingly enough, Progressive leaps to the top of the list for truck camper insurance passing Allstate, USAA Group, and State Farm Group. If you need insurance for your truck camper and your truck insurance company isn’t interested, try Progressive. Of course the next biggest truck camper insurers mirror the truck list; Allstate, USAA Group, and State Farm Group, and so on. Liberty Mutual falls several rungs indicating that they are not as truck camper friendly as they could be. Then again National General Group and Foremost are up indicating they are.